When it comes to decorating, the finishing touches can add an incredible ambiance and new look to your home. It is the little things that make a big difference. Finishing touches complete a room and bring balance to the design. On the whole, customising any room is rather simple. With some inspired ideas and a touch of ingenuity, your space will be transformed into your dream home. Here are a few decorating tips that is affordable, simple and brilliant. Sleek, tall and streamline is the latest style in décor. The once so popular overstuffed room is a day in the past. Clutter is out and simple design is in. Up-to-date décor includes wood and upholstery with chrome or stainless steel accents. A touch of modern with the old is also trendy. One of the best ways to add the ever so popular “chrome look” is with furniture legs. You can add chrome legs to kitchen tables, upholstered chairs, cabinets, coffee tables, dressers, hardware and even some appliances. Today, tall is also a very popular style for furniture. So, a great way to modernize your home is to increase the height of an item with furniture legs. Stainless steel and chrome legs add the perfect amount of height, delivering a nice streamline appeal. An out of date piece of furniture can make your home appear old-fashioned. However, mixing the old with the new is quite stylish. Instead of buying new furniture, you can upgrade your older furniture with a few simple tricks. For example, your antique can easily be improved with a coat of special wax or varnish and chrome legs. You can also have the legs custom made. Today it is easy to add legs to your old furniture. It is also very cost effective. Redesigning your furniture is a whole lot cheaper than buying brand new modern pieces. The variety of furniture legs is endless, making it easy to match your décor. And if you do not find what you want, then custom made is the answer. When updating your home, money plays a big factor. You want the very best quality for a reasonable price. Now there are a large variety of furniture legs such as wood, stainless steel and chrome. Both stainless steel and chrome legs are a very popular style. Because stainless steel is a popular title in itself, many find other metals inferior. However, this is a misconception. When it comes to strength tests, chrome does quite well. Unfortunately, it is often overlooked because the title suggests a mere finish. Then again, if an item is labeled chrome then it contains a certain amount of chromium in the coating. Actually, the chrome finish process utilizes electroplating. The layer is about a millimeter thick and contains other metals such as steel. Although the layer is thin, it is very durable. Compared to stainless steel, chrome is by far more cost effective. In addition, chrome is an excellent choice for urban design. It has a more polished and reflective finish and far outshines its counterpart. Chrome is also resistant to rust and damage. 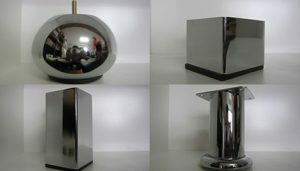 So if you want state-of-the-art design at a lower price, chrome furniture legs are the ideal selection for your needs. © Copyright 2017. All rights reserved by | » Chrome Furniture Legs Peter Ross Enterprises Melbourne | Website Designed by: Netwizard Design.